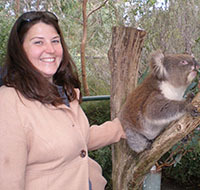 Molly, who came to W&M in 2011, has worked with scholarship programs, the Keio summer program, and all W&M summer programs during her tenure at the College. Currently, in her role as Associate Director, Molly oversees the process and administration of all established W&M Programs for A&S students (summer and semester), aids in the development of new programming, and continues to manage a portfolio of summer programs, as well as regional advising duties for East Asia, including advising for the outgoing exchanges in the region. She strives to ensure that all students are able to find a program that will enhance and complement their education on the W&M campus. Previously to coming to W&M, Molly worked in the Study Abroad & Student Exchange Office at the University of Arizona and her international experiences include studying abroad in the UK and Russia prior to becoming a Peace Corps Volunteer in Ukraine. W&M Summer Programs: Adelaide, Cape Town, Goa, Rio de Janeiro and Santiago.